Danny was Tiana’s first horse, and without a doubt, the single greatest factor in the development of her eventing career. This very wise and generous horse taught her most everything that she knows, and built up an impressive list of competitive results along the way. 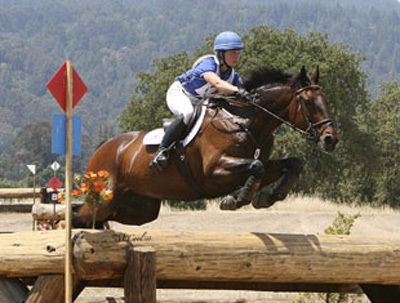 Most of all, he was the springboard that propelled Tiana into the world of eventing. A horse this patient and talented is truly the subject of fairy tails. In the end of 2007 Danny began experiencing pain resulting from a cartilage abnormality in his fetlocks and Tiana made the difficult decision to retire him from international competition. While he still had many great things ahead of him, his quality of life took first priority. He is now very happily doing his part to keep the grass mowed on a small farm in Oregon and enjoying the daily love and attention that he so deserves. He has earned a very special place in our hearts, and we are most grateful to everyone who has been a part of his career and retirement.